Remember to check Canadian PSN Store prices before purchase, as you may get more for your money there (prices will vary per title in CAN $). How is Burnout a good deal if you are only saving 50p? Well pointed out, I've updated the post title! Thought great burnout price then see stupid US store! No ps plus needed on these this time? How long is the sale on? What’s the point if it not a good price don’t buy it! I cannot be bothered to have to have registered accounts in every country just to save 50p it’s just not worth it and surely to go online on us store game you’d need a US PS plus?? Also why not buy discounted PS credit? Save money that way? What’s the point if it not a good price don’t buy it! I cannot be bothered …What’s the point if it not a good price don’t buy it! 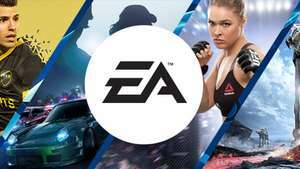 I cannot be bothered to have to have registered accounts in every country just to save 50p it’s just not worth it and surely to go online on us store game you’d need a US PS plus? ?Also why not buy discounted PS credit? Save money that way? Is SW Battlefield worth getting just to see the VR mission? I'm going to have a go at this. Till the 26th of this month. Yes for that price. Its awesome. I dont think I have seen a deal for JPN. Do these get posted? Can you use starling bank for this also? Looks like I'm finally getting unravel 2. Enjoyed the first one. 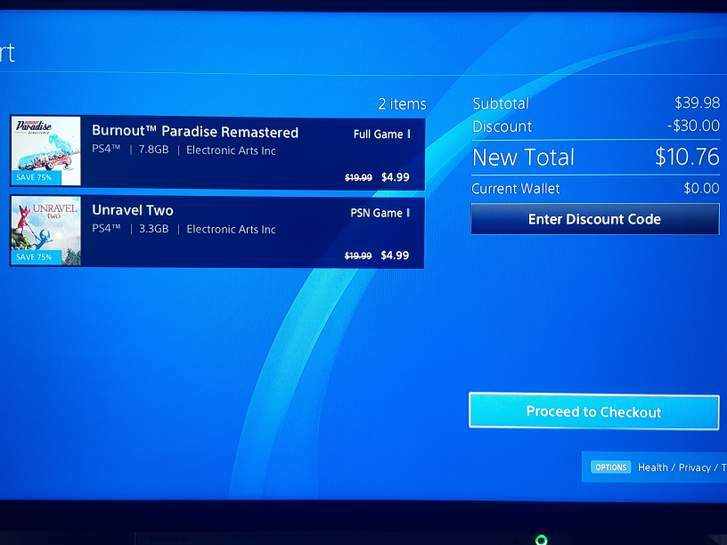 Taking my first plunge into the US PSN store for the amazing deal on Burnout and Unravel. Any ideas why my basket total is $10.76 instead of the expected $9.98? 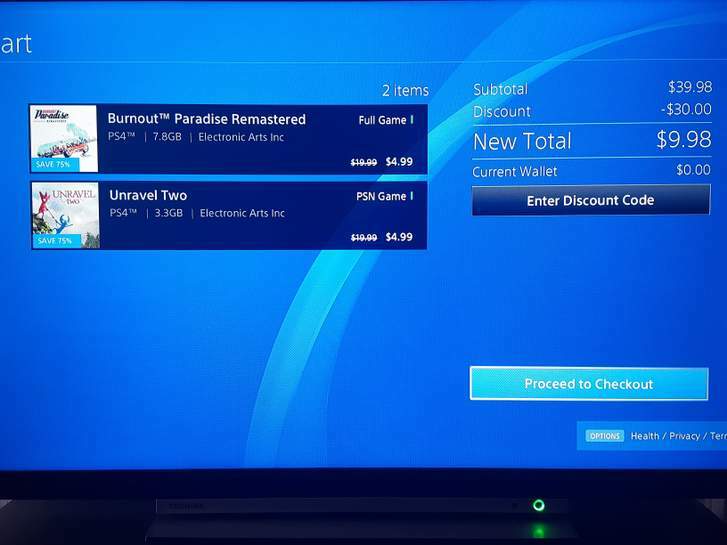 [Image] Taking my first plunge into the US PSN store for the amazing deal …[Image] Taking my first plunge into the US PSN store for the amazing deal on Burnout and Unravel. Any ideas why my basket total is $10.76 instead of the expected $9.98? Great price on Battlefield 1 revolution and burnout remastered. Even NFS Payback is tempting at this price. Heat added. Brilliant, thank you! Changed the address to California and it worked a treat. Ok i will take the plunge, but if you are wrong you will be hearing from my lawyers. But heat for those who get a deal from these. When purchasing the Psn gift card through Amazon.com I receive the message "This item is not available for purchase due to geographical restrictions", If i simply change my billing address to an American address on amazon will this suffice and not cause any problems with my bank etc? When purchasing the Psn gift card through Amazon.com I receive the message …When purchasing the Psn gift card through Amazon.com I receive the message "This item is not available for purchase due to geographical restrictions", If i simply change my billing address to an American address on amazon will this suffice and not cause any problems with my bank etc? Thanks, Looking at PCGameSupply and I've seen some mentions of an extra 'Activation Charge'... Is that true? I have american address for gift card purchases and my real address for other purchases and never had any problems. Thanks, Looking at PCGameSupply and I've seen some mentions of an extra …Thanks, Looking at PCGameSupply and I've seen some mentions of an extra 'Activation Charge'... Is that true? Ok, you can rest easy, this was worth even the £5 i spent on it, it was a fantastic Vr experience, yes it is only 20 mins max but this is what VR was made for, i can now only dream of the day when the X-Wing and Tie Fight Lucasarts PC games become updated to play in VR like this. Ok, you can rest easy, this was worth even the £5 i spent on it, it was a …Ok, you can rest easy, this was worth even the £5 i spent on it, it was a fantastic Vr experience, yes it is only 20 mins max but this is what VR was made for, i can now only dream of the day when the X-Wing and Tie Fight Lucasarts PC games become updated to play in VR like this. Does Disney own the PC games too?